In the Winner's Circle Durrant told the Diesel TV cameras, "It was a great season of for my team and me. We showed up to the World Finals with a wounded motor but we wanted to win the National Championship and that's what we did." "I want to say thank you to my sponsors for helping me this season, Wild Diesel and Alpha Hydronics. I also want to thank my wife, Joy, for coming to these events and being there along the way." 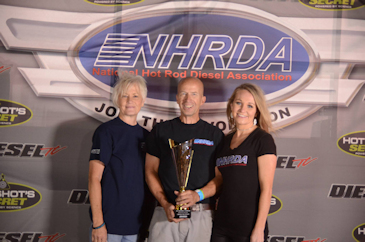 Durrant will now look towards the 2018 NHRDA season and will be looking for a repeat in the Limited Pro Stock class.